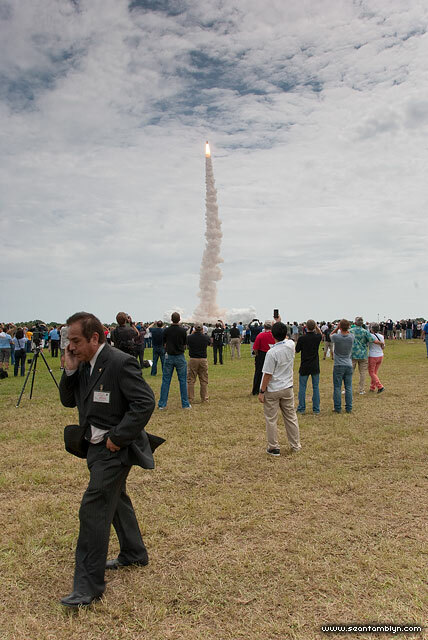 A gentleman conducts important business on his phone as Atlantis reaches for the clouds, mere seconds after the final launch of the space shuttle program. This entry was posted on Thursday, February 16th, 2012 at 5:32 pm. It is filed under Areas, STS-135 Atlantis, The Space Shuttle Project and tagged with Nikon 18-200mm f/3.5-5.6G IF-ED AF-S DX VR II, Nikon D40x, PClix LT. You can follow any responses to this entry through the RSS 2.0 feed.